Clearing the Error is a collaborative effort between the Society to Improve Diagnosis in Medicine (SIDM), the Maxwell School of Citizenship and Public Affairs at Syracuse University, and the Jefferson Center, with funding from the Agency for Healthcare Research and Quality (AHRQ). From September 2014 through March 2017, the organizations worked together to determine how patient and healthcare consumer input could inform education and advocacy to reduce diagnostic error and shift the growing conversation on diagnostic error in ways that empower patients and their advocates. 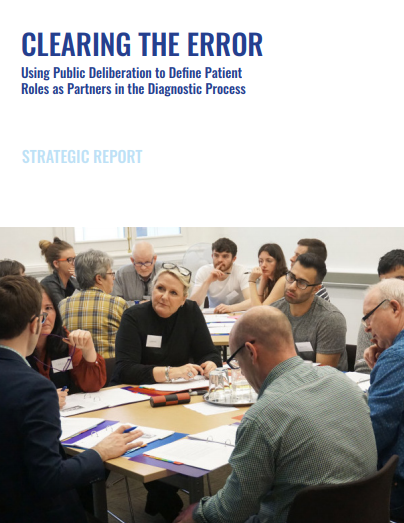 The project utilized deliberative approaches to engage healthcare consumers in developing informed, practical, patient-focused recommendations for improving diagnostic quality. SIDM’s stated desirable outcome of the deliberation was an understanding of what actions patients might be willing and able to take to improve the quality of diagnosis in order to inform their strategic planning for educational and advocacy efforts. Data from the project can inform patient education strategies, and recognizing healthcare consumers as the source of recommendations may increase audience receptivity to educational efforts.